Dr. Bayne is a board certified plastic and reconstructive surgeon who was born and raised in the Midwest. Dr. Bayne has a Bachelor of Arts degree from Augustana College graduating in June 1984, he attended University of Illinois, College of Dentistry graduating in June 1986 with a Bachelor of Science degree in Dentistry. He attended Rush Medical College and completed his medical training in June 1990 with a doctorate in medicine. Dr. Bayne completed seven years of surgical residency: in 1990 to 1995 he attended Akron City Hospital for General surgery and in June 1995 to 1997 he completed his Plastic Surgery training from Summa Health Systems, Akron Ohio. He served as Chief Resident in General Surgery as well as in Plastic Surgery. Dr. Bayne is Board Certified by The American Society of Plastic Surgery. 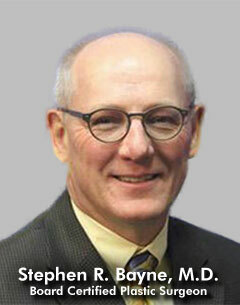 Presently Dr. Bayne lives in the Midwest, he loves spending time with his wife and children. He enjoys outdoor activities, skiing, school sports, working on his farm, hunting and fishing.